Sea of Thieves, Rare’s big open world title to bring them out of a years-long Kinect and Avatar bender, might have had some choppy seas as it set sail, but as time has gone on and Rare has polished the experience, faithful pirates have been rewarded with seeing the vision they had for the game fill out. 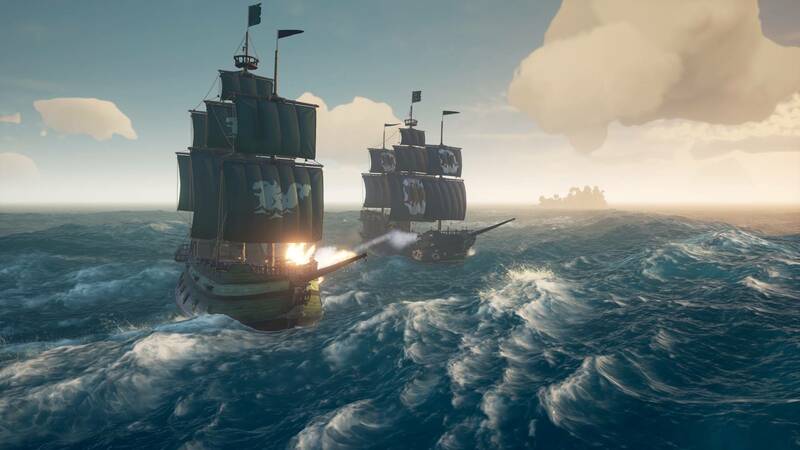 In a recent interview with Gamespot, Sea of Thieves executive producer Joe Neate discussed the immediate aftermath of the launch, and how players reacted to the Hungering Deep expansion. When the expansion’s content finally gave a real push to move the game away from “Sink anything that moves” to something that needed co-operation, fans were surprised. Rare hopes to keep doing that. “Broadly, the response from the community was that this game is great, we love what you’re doing, but give us more things to do,” said Neate. The interview hinted at the addition of Skeleton ships to the game in the near future, which deviates from the line of all ships being players that was given before launch. Neate hopes that the addition of the Skeleton ships further encourages players to cooperate. “We love to see different crews team up and then go take down stuff together,” said Neate. He is, of course, talking about the upcoming expansions for the game. Cursed Sails will be adding NPC pirate crews to game, and launches on while another upcoming expansion, Forbidden Shores, will be adding a new area to the game. Previous articleNVIDIA GeForce GTX 1180 From ASUS Leaked By Vietnamese Store; Launches September 28?